With a wave of impossible Revenants, deadly magic and ancient vampires pursuing vendettas and plots, they have arrived, and Jane must run from attack to attack and unravel some extremely convoluted, ancient plots, drawing on all her resources to try and stem the tide. This book is action packed – completely and overwhelmingly action packed. To a degree that I don’t even get when Jane actually gets to sleep. The European vampires are here and there’s some really long running plots happening, with lots of manipulations that have been put in place decades ago because this is how vampires plot. When you live for centuries, it’s standard to make plans that may span centuries. Basically, unless you have an incredibly good memory or have recently had a re-read of the entire series? This book takes a lot of work to follow. Especially since very little is actually explained in great detail as Jane and her crew run from battle to battle with rising Revenants and vampires attacks and strange lightning magic and time acting up and powerful, dangerous euro-vampires and kidnapping. It’s full of action and its awesome action and exciting and powerful and contains a lot of excellent fighting and confusion and investigating and more battling. We have this overlaid with Jane’s ongoing moral quandary over who she is, especially as she continues to be put in a position where she has to kill humans, not just vampires and her continued concern as to exactly where her moral compass is. There’s a really awesome moment with Hayyel in this in which she definitely doesn’t just take his reassurance for it. So it’s a very good, very action packed read with some really good personal focus on Jane – but my gods it is easy for you to get lost and forget chunks and think things like “Adrianna? Wait, she was a thing? Do I remember her? Should I?” and occasionally getting lost between the duelling vampire plots. 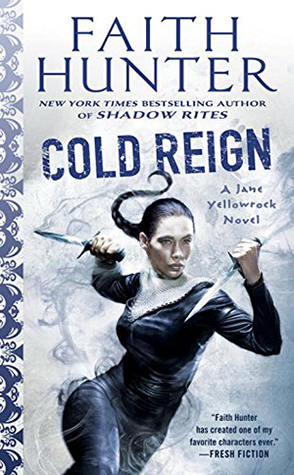 At the same time that does kind of set the tone of the book – after all this level of chaos and confusion is how Jane – and we – are supposed to feel when confronted by decades old duelling vampire plots. A few books ago, this series finally addressed its complete lack of meaningful LGBT inclusion by handwaving pretty much every vampire as bisexual. Despite very little of that being shown in previous books and even now it’s only something that is mentioned: even in his book when Leo is actually in a bed with his two lovers, Kate is clearly in the middle (mentioned very carefully in case we think Leo actually touched another man). On top of this, their bisexuality seems to be linked to how Jane sees vampires as sexually debauched hedonists. But more than this referred-to-but-never-actually-seen representation, there’s the way Jane refers to that male lover: Grégoire. It’s demeaning, belittling and shaming – lots of references like “boy toy”. (And the fact he is very young and repeatedly raped also is a major part of this character). She never refers to Kate or any women Leo has slept with in those terms. There’s a strong whiff of homophobia about the entire portrayal. Her colleagues and surrogate family are the Younger brothers, both mixed-race Black men and very very different from each other (one an army ranger with lots of discipline and fighting skills, the other a computer nerd of similar brilliant skill – but also skill in general organisation). The relationship between the three of them is probably the closes there is there – even between Jane and Bruiser, her love interest. Her closest family is definitely the Younger brothers, beyond anything else, and it’s purely platonic and still very much based on love and respect. It’s an excellent female/male friend relationship, perhaps the best I’ve seen in the genre (again, not the highest bar to leap over here). Edmund and Brute are also integrating nicely and really well with this relationship without disrupting the awesomeness that is already there. There are some skilled and intelligent women in this book – like Katie and Darcy along with Aggie and her mother and Jodie. But they’re really really rarely referred to and are really peripheral to Jane’s life. They’re side characters, they appear briefly, they’re not hugely involved and Kate is a very fraught character when it comes to a whole lot of dubious decisions and trust issues. Basically, there are few women who are meaningful part of Jane’s life. The closest is Aggie – but she only visits Aggie and she’s very peripheral to the rest of her life. Contrast that to Eli, Alex, Leo, Bruiser, Edmund, Gee, Leo’s entire security team – there’s a lot of men in Jane’s life. Constantly in Jane’s life – and not a whole lot of women. Even Molly has become a much less constant character. We do have some good references to the trauma many of these characters have faced. Both Jane and Eli have experienced things that have left them with PTSD. It’s not something we spend a lot of time on, but it’s there, it’s respected, it’s understood and treated well. But it is something of a single brief moment and reference. In all this is a very enjoyable book to read. It’s exciting, it’s action paced, it’s full of intrigue and twists with a whole lot of Jane and her excellent family. We have a lot of racial inclusion and a New Orleans that isn’t white washed and we have a lot of really good and unique world building. It draws heavily on the whole series so you definitely need to be focused and maybe a re-read is necessary – it’s not an easy read and it can be confusing. But other than that it’s an excellent read and a great addition to this whole series.